Kick Off the Fall Season with Some Pineapple Facts! As the fall season draws nearer, visions of hot cocoa, pumpkin spice treats and cookies of every variety begin to dance in our heads. When you think of a fall cuisine, it’s most likely that your mind immediately turns to thinking of pumpkin, squash and other Thanksgiving day staples like cranberries and mashed potatoes. However, these stereotypical fall treats can leave you feeling lethargic and weighed-down. Mix up your fall cuisine with the perfect treat to kick off the season: the perfect Chestnut Hill Farms pineapple! Not only are our pineapples juicy, delicious and available year round, they are packed with nutritional values that will help boost your immune system and keep you feeling healthy all winter long. 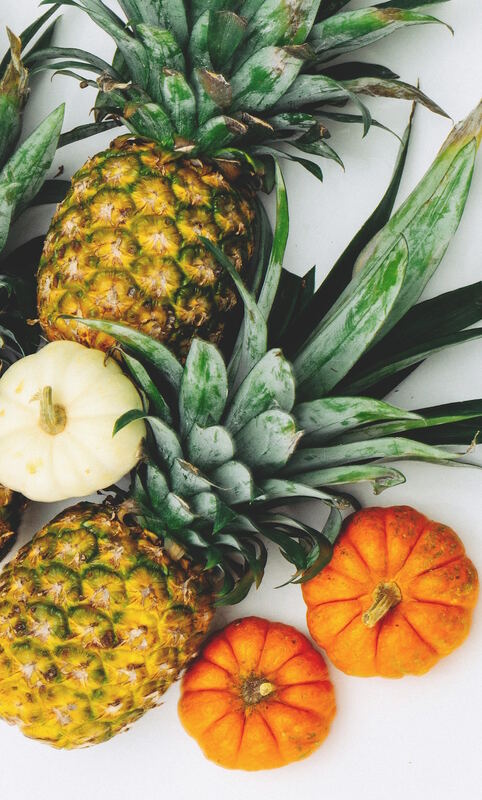 Check out some of our favorite fall pineapple facts below! Sure, we agree that our perfect pineapples make for a refreshing summertime treat and for a mean pina colada, but fall is one of the best times of year to enjoy our pineapples. Pineapples are plentiful in the fall season, meaning that they will be even easier to find at your local grocery. Remember: when picking out your perfect pineapple from the shelf, each and every fruit is ripe and ready to enjoy! Pineapples do not ripen once they have been picked, so if a pineapple is on the shelf, it’s ripe and ready to go. As Dr. Lloyd explained earlier this month, the sugars found in pineapples are entirely different and affect your body differently than refined sugars do. In fact, evidence has found time and time again that it is impossible to receive negative metabolic effects from consuming fruit. Although fruits can have a high sugar content, they are also full of fiber, water and chewing resistance. This means that chopping on a slice of pineapple will take you longer to consume than popping a piece of candy or other sweet, letting your body properly absorb the sugars that it is consuming. Due to this, your body can more easily metabolize fructose found in fruits than in artificially sweetened foods. Learn more about the differences in refined and natural sugars here. This is perhaps the biggest myth of all when it comes to our perfect pineapples! Although we agree that our pineapples can taste as sweet as candy, this doesn’t mean that they aren’t good for you. On the contrary, pineapples are packed with Vitamin C and bromelain, both of which have some amazing health benefits. High concentrations of Vitamin C significantly improve the immune system to fight off cold and sickness, while bromelain works as an anti-inflammatory. Bromelain also works to fight off infection and to eliminate bacteria. This powerful combination is just what you need to get your body geared up and feeling healthy for the change of the seasons. Though most may think of pineapples as a tropical treat, there is truly no better time to enjoy the fruit than the fall season. A sweet treat that can help keep you feeling healthy all season long? What’s not to love! While a fresh pineapples may look intimidating to slice into with its spikey skin and tall crown, this fruit can be broken down in just a few easy steps! In fact, it’s so easy that we’ve shown you our preferred method for slicing and dicing this sweet fruit in the video below in under one minute! Not only do fresh pineapples have the best flavor possible, they do not contain the added sugars that several canned products of the fruit do. We’ll admit, there’s nothing quite like savoring the sweet flavor of a pure fresh pineapple. But there is so much more that you can do in the kitchen with this tropical fruit! One of our favorite and easiest pairings is to sprinkle on some TAJÍN® spice on some freshly cut slices. This zesty spice mix is made of ground chile peppers, salt and dehydrated lime juice and can quickly elevate any fruit to the next level. For more perfect pineapple fall recipes, check out some of our favorites here! 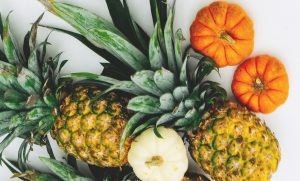 This entry was posted in Featured, Latest News, Recipes, Tips & Tall Tales and tagged fall, fall pineapples facts, fall recipes, pineapple recipes, pineapples facts. Bookmark the permalink.